Synthetic peptide within Human beta III Tubulin (C terminal). The exact sequence is proprietary. ICC/IF: PC-12 and wild-type HAP1 cells. WB: HAP1 cell lysate. HeLa, PC-12 and HEK-293 whole cell lysate. 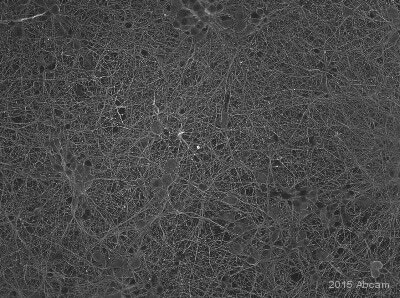 Mouse and rat brain and spinal cord tissue lysate. IHC-P: Human breast carcinoma tissue. Flow Cyt: U-87 MG and HeLa cells. IHC-Fr: Zebrafish retina sections. Our Abpromise guarantee covers the use of ab52623 in the following tested applications. WB 1/1000 - 1/10000. Detects a band of approximately 52 kDa. Flow Cyt 1/10 - 1/1000. ab52623 staining beta III Tubulin in wild-type HAP1 cells (top panel) and TUBB3 knockout HAP1 cells (bottom panel). The cells were fixed with 100% methanol for 5 minutes, permeabilized with 0.1% Triton X-100 for 5 minutes and then blocked with 1% BSA/10% normal goat serum/0.3M glycine in 0.1% PBS-Tween for 1 hour. The cells were then incubated with ab52623 at 1/500 dilution and ab195889 at 1/250 dilution (shown in pseudocolour red) overnight at +4°C, followed by a further incubation at room temperature for 1 hour with a goat secondary antibody to Rabbit IgG (Alexa Fluor® 488) (ab150081) at 2 μg/ml (shown in green). Lanes 1 - 4: Merged signal (red and green). Green - ab52623 observed at 52 kDa. Red - loading control, ab8245, observed at 37 kDa. ab52623 was shown to specifically react with beta III Tubulin in wild-type cells as signal was lost in beta III Tubulin knockout HAP1 cells. Wild-type and beta III Tubulin knockout samples were subjected to SDS-PAGE. Ab52623 and ab8245 (Mouse anti GAPDH loading control) were incubated overnight at 4°C at 1/1000 dilution and 1/10000 dilution respectively. Blots were developed with Goat anti-Rabbit IgG H&L (IRDye® 800CW) preabsorbed ab216773 and Goat anti-Mouse IgG H&L (IRDye® 680RD) preabsorbed ab216776 secondary antibodies at 1/10000 dilution for 1 hour at room temperature before imaging. Western blot - Anti-beta III Tubulin antibody [EP1569Y] (ab52623)Eng et al PLoS One. 2017 May 17;12(5):e0177834. doi: 10.1371/journal.pone.0177834. eCollection 2017. Fig 5. In vivo, CK1δ T347 is phosphorylated in trans. D) Phosphorylation of CK1δ at T347 is not dependent on CK1 activity. HEK-293 cells over-expressing wild-type CK1δ were treated with CK1 inhibitors PF670462 (PF670, 1 μM), PF4800567 (PF480, 1 μM), or D4476 (30 μM) for 3 hours, followed by addition for 30 min of either DMSO or 40 nM Calyculin A. Cell lysates were immunoblotted for anti-pT347 or anti-Myc antibodies. CK1 inhibitors block the autophosphorylation-induced mobility shift but do not decrease phosphorylation of T347. Myc-tagged CK1δ indicated by curly brackets. ab52623 lower panel. ab52623 staining beta III Tubulin in NGF-differentiated PC-12 (Rat adrenal gland pheochromocytoma cell line) cells. The cells were fixed with 100% methanol (5 minutes) and then blocked in 1% BSA/10% normal goat serum/0.3M glycine in 0.1%PBS-Tween for 1 hour. The cells were then incubated with ab52623 at 5 μg/ml and ab7291 at 1 µg/ml overnight at +4°C, followed by a further incubation at room temperature for 1 hour with an AlexaFluor®488 Goat anti-Rabbit secondary (ab150081) at 2 μg/ml (shown in green) and AlexaFluor®594 Goat anti-Mouse secondary (ab150120) at 2 μg/ml (shown in pseudo color red). Nuclear DNA was labeled in blue with DAPI. ab52623, at a 1/50 dilution, staining class III beta Tubulin in human breast carcinoma tissue using Immunohistochemistry, Paraffin embedded tissue. Overlay histogram showing U-87 MG (Human glioblastoma-astrocytoma epithelial cell line) cells stained with ab52623 (red line). The cells were fixed with 80% methanol (5 min) and then permeabilized with 0.1% PBS-Triton X-100 for 20 min. The cells were then incubated in 1x PBS / 10% normal goat serum / 0.3M glycine to block non-specific protein-protein interactions followed by the antibody (ab52623, 1/1000 dilution) for 30 min at 22ºC. The secondary antibody used was Alexa Fluor® 488 goat anti-rabbit IgG (H&L) (ab150081) at 1/2000 dilution for 30 min at 22ºC. Isotype control antibody (black line) was rabbit IgG (monoclonal) (ab172730, 0.1 μg/1x106) used under the same conditions. Unlabeled sample (blue line) was also used as a control. This antibody gave a positive signal in U-87 MG cells fixed with 4% paraformaldehyde (10 min)/permeabilized with 0.1% PBS-Tween for 20 min used under the same conditions. 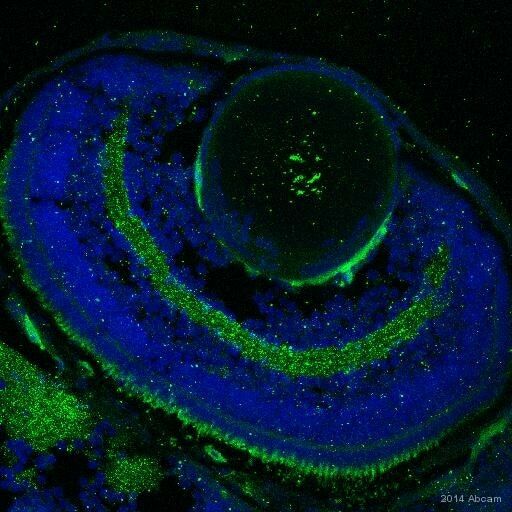 IHC-Fr image of Beta III Tubulin staining on zebrafish retina sections using ab52623 (1:100). The sections were fixed with paraformaldehyde and permeabilized using Triton-X. Antigen retrieval was performed using Tris-HCl. Blocking was perfomed using 5% BSA for 1 hour at 23°C. ab38738 was diluted 1:100 and incubated with the sections for 16 hours at 4°C. The secondary antibody was goat polyclonal to rabbit IgG conjugated to Alexa Fluor®488 (1:1000). This blot was produced using a 4-12% Bis-tris gel under the MOPS buffer system. The gel was run at 200V for 50 minutes before being transferred onto a Nitrocellulose membrane at 30V for 70 minutes. The membrane was then blocked for an hour using Licor blocking buffer before being incubated with ab52623 overnight at 4°C. Antibody binding was detected using ab175781 at a 1:10,000 dilution for 1hr at room temperature and then imaged using the Licor Odyssey CLx. Flow Cytometry analysis of HeLa (Human epithelial cell line from cervix adenocarcinoma) cells labeling beta III Tubulin with ab52623 at 1/20 (red). Cells were fixed with 4% paraformaldehyde and permeabilized with 90% methanol. 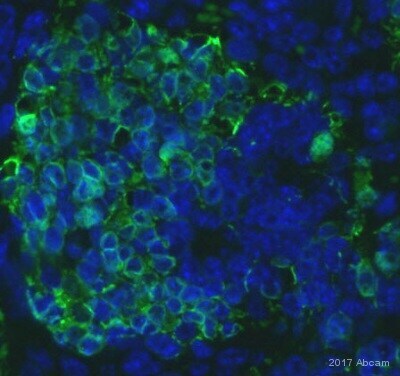 An Alexa Fluor® 488-conjugated goat anti-rabbit IgG (1/2000) was used as the secondary antibody. Black - Isotype control, rabbit monoclonal IgG. Blue - Unlabeled control, cells without incubation with primary and secondary antibodies. Publishing research using ab52623? Please let us know so that we can cite the reference in this datasheet.